On Monday, October 1, 2018 the Nobel Committee announced the recipients of this year's Nobel Prize in Physiology or Medicine. 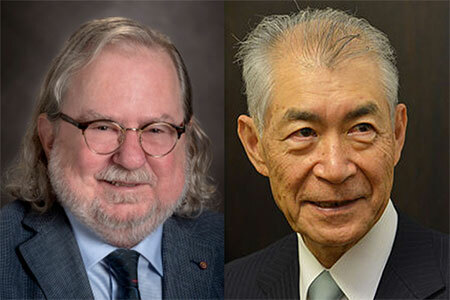 The two Nobel laureates were James P. Allison — a professor and immunologist from MD Anderson Cancer Center — and Tasuku Honjo — an immunologist from Kyoto University. Both researchers split the prize evenly for their pioneering discoveries relating to "cancer therapy inhibition of negative immune regulation." The distinguishing factor of this award, as opposed to other prizes in physiology or medicine, is that it is the first cancer therapy to be recognized with a Nobel prize. The basis for both researchers' work lies in the natural role of the human immune system as the body's defense against foreign pathogens and mutant cells. However, one of the trademarks of cancer is the cancerous cells' ability to avoid and bypass the immune response. This trait is one reason that many malignant tumors can grow unnoticed for years without triggering the defensive mechanisms of the immune system. An example of built-in responses that aim to prevent the development of mutant cells are cell cycle and immune checkpoints. Immune checkpoints are essential for maintaining homeostasis — ensuring that foreign pathogens are eradicated while internal organs are tolerated. Multiple diseases arise from the failure of the immune system to recognize internal components. This condition, referred to as a lack of self-tolerance, gives rise to various kinds of autoimmune disorders. On the other end of the spectrum is the failure of the immune system to protect the host from invading pathogens or mutated cells expressing dysregulated levels of either inhibitory or stimulatory signals. This is the concept that both Nobel laureates aim to address in their work. With regards to cancer, numerous studies have shown that tumors can bypass immune checkpoints resulting in a diminished immune response. Since the mid-1990s, multiple proteins involved in the immune response have been identified as checkpoint targets for potential therapies. One protein, CTLA-4, was first discovered in 1987 by Pierre Goldstein and later in 1995 as a negative regulator of T-cell activation1. Dr. James Allison's work focuses on the regulation of T-cell responses and the roles of receptor proteins CD28 and CTLA-4. Specifically, CTLA-4, short for cytotoxic T-lymphocyte-associated protein 4, is a receptor protein that aids in downregulating the immune response. CTLA-4 inhibits T-cell activation, thereby allowing the growth of tumors to continue instead of generating an inflammatory immune response. In the last ten years, Dr. Allison's Lab has developed the drug ipilimumab — a monoclonal antibody against CTLA-4 — which was the first immune checkpoint blockade treatment approved by the FDA in 20115. Similar to Dr. Allison's work, Dr. Tasuku Honjo's research also focuses on immune checkpoints and how they can be manipulated for cancer treatment. The specific protein Dr. Honjo currently studies is PD-1, short for Programmed Cell Death Protein 1, which is a receptor protein also located on the surface of T-cells. The protein's role in the immune response is to downregulate the inflammatory response by suppressing T-cell activity. It therefore also promotes self-tolerance and is extremely important in preventing autoimmune disease2. By targeting either CTLA-4 or PD-1, immune checkpoints that would otherwise allow for the suppression of the inflammatory response can be reversed. This reversal will halt the immune system in place, activating the T-cells and resulting in the attack of malignant tumors. Instead of utilizing exogenous growth suppressors (i.e., chemotherapy, radiation), this technique allows the human body to use the immune system as a treatment against cancer. This is the reason why the term "hijacking the immune system" is frequently used to summarize this technique. Overall, there is great promise in these checkpoints as targets for immune-based therapeutics and improvements in personalized medicine. 1. Brunet, J.-F., Denizot, F., Luciani, M.-F., Roux-Dosseto, M., Suzan, M., Mattei, M.-G., & Golstein, P. (1987). A new member of the immunoglobulin superfamily--CTLA-4. Nature, 328(6127), 267-270. 2. Iwai, Y., Hamanishi, J., Chamoto, K., & Honjo, T. (2017). Cancer immunotherapies targeting the PD-1 signaling pathway. Journal of Biomedical Science, 24(1), 26. 3. Tivol, E. A., Borriello, F., Schweitzer, A. N., Lynch, W. P., Bluestone, J. A., & Sharpe, A. H. (1995). Loss of CTLA-4 leads to massive lymphoproliferation and fatal multiorgan tissue destruction, revealing a critical negative regulatory role of CTLA-4. Immunity, 3(5), 541-547. Retrieved from http://www.ncbi.nlm.nih.gov/pubmed/7584144. 4. Waterhouse, P., Penninger, J. M., Timms, E., Wakeham, A., Shahinian, A., Lee, K. P., et al. Mak, T. W. (1995). Lymphoproliferative disorders with early lethality in mice deficient in Ctla-4. Science (New York, N.Y.), 270(5238), 985-988. Retrieved from http://www.ncbi.nlm.nih.gov/pubmed/7481803. 5. Wolchok, J. D., Hodi, F. S., Weber, J. S., Allison, J. P., Urba, W. J., Robert, C., et al. Korman, A. J. (2013). Development of ipilimumab: a novel immunotherapeutic approach for the treatment of advanced melanoma. Annals of the New York Academy of Sciences, 1291(1), 1-13. https://www.ncbi.nlm.nih.gov/pmc/articles/PMC3910157/.